Hiking the rest of Apalachicola National Forest today, I passed through two special sections - the dry part of Bradwell Bay Wilderness, and the high sandy banks beside the deep, dark Sopchoppy River. What I particularly loved about both sections were their distinctive trees. 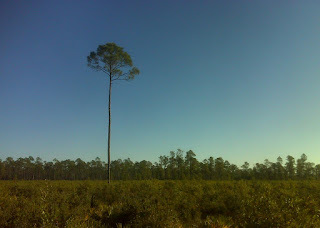 In Bradwell Bay, the pines in the open stands of savanna almost seemed to be identical - clones of one another, repeated over and over, or some sort of fractal holograph in which the creator took one tree and 'pasted' it into the scene over and over. It was a pleasure to tramp through here and not worry about getting my feet wet. I was not so fortunate going through the rest of Apalachicola National Forest's trail. Actually, along the Sopchoppy, once you ford a hefty tributary where there is no bridge, there were no more opportunities to get wet. Every wet spot and gully had a bridge. Most impressive was the bridge over Monkey Creek. But as I said, the trees stole the show here. 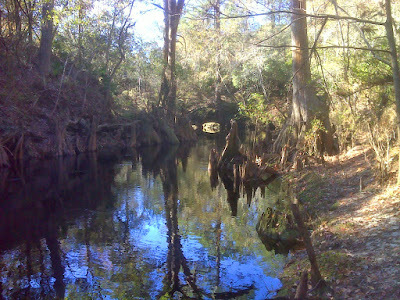 In particular the massive buttressed trunks of the bald cypress that populate the river bed. Each one has its particular character and is often accompanied by 'knees' and angry looking twisted roots. Here's a sampling of my favorites. It was a bright, sunny, clear day that started out frosty and never got to 60F. Excellent! The result was that I did not encounter a single mosquito all day, which was another welcome change from my typical Apalachicola National Forest experience. But by the end of today I had reached the eastern end of this 'unit' and had passed into St. Marks National Wildlife Refuge. There a completely different form of tree was the star. Watch for the next posting. Below is a map of today's route with links to many more photos.